I was ironing a favorite summer shirt and skirt today when this blog topic popped into my head. There are so many lovely border prints out there; and seemingly so few patterns that suit them. Conventional wisdom says you need straight lines which would seem to eliminate many interesting designs such as flared skirts and shaped blouses. Wrong!! Here are two projects to illustrate. First, my laundry for today. 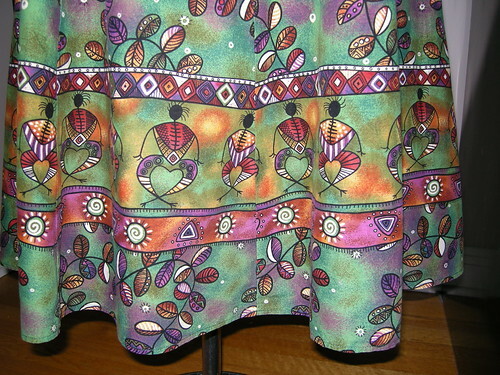 Some years back, I used a cotton print with 2 different borders to make a shapely 8-gored flared skirt and matching shirt with front and back yokes and princess seaming. The print featured quirky vines through the middle of the fabric, and a border at each selvedge with stylized figures and narrower design bands at the top and bottom of the figures. 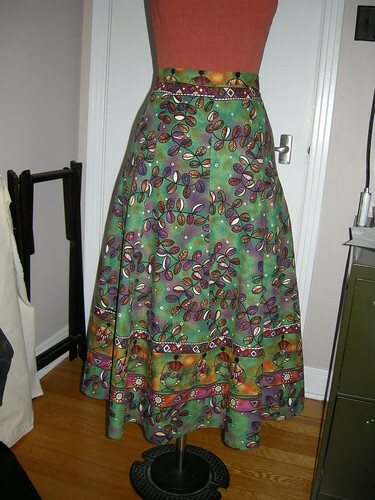 I cut my 8 gores using the full band at the bottom, and it so happened that I could use one of the narrow bands at the top of the skirt pieces. Obviously this meant I had to cut the pieces "sideways" on the cross grain. If I recall, the border was the same at both sides, so I could place the triangular pattern pieces very economically using both edges. Here's a close up of the hem. You can see one seam in about the middle of the picture - I tried as much as possible to cut so that the figures would not be chopped up by the seams. While each pattern piece has a slight curve at the hem and the border is (more or less) straight, the overall effect is a printed border that tracks the curving hem line perfectly. What about the shirt? I used a Burda magazine pattern from the late 1990s (I think). It features a front and back yoke (front is slightly angled down from the armscye to CF), princess seams, and a collar with lapel. As you can see, I cut the yoke pieces so that the border tracks the yoke edge. This meant I had to ignore the grain line on the pattern pieces. It is possible to do this without causing the world to come to an end! I did the same in the back, but could respect the straight grain for the back yoke, which is horizontal. Here's another project using a border print in an interesting way. 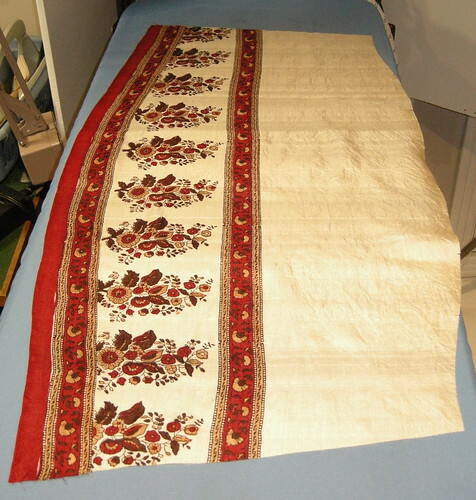 I was lucky enough to have a silk sari which had two different border prints - a wide one at one selvedge (meant to be the hem) and a narrow one at the other. 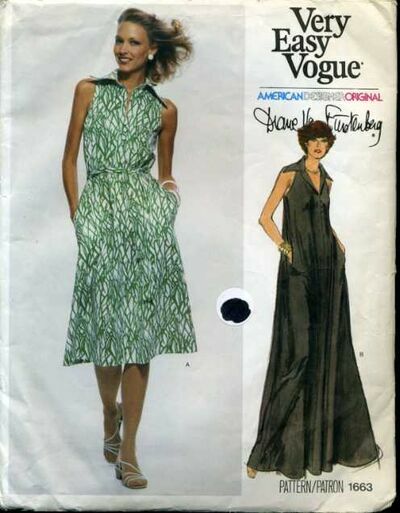 I used a Vogue pattern (8193, now OOP) which features large puffed sleeves and a triangular shawl collar. 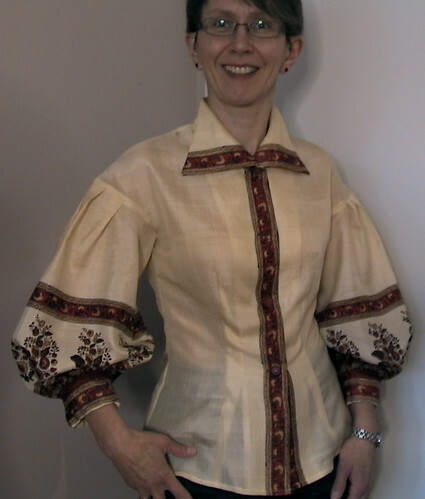 I used the wide border for the sleeves and the narrow border at the CF and collar edges, and for the sleeve cuffs. Again, this meant I had to selectively ignore the grain lines on the pattern pieces (especially for the upper collar - I also had to create a CB seam). 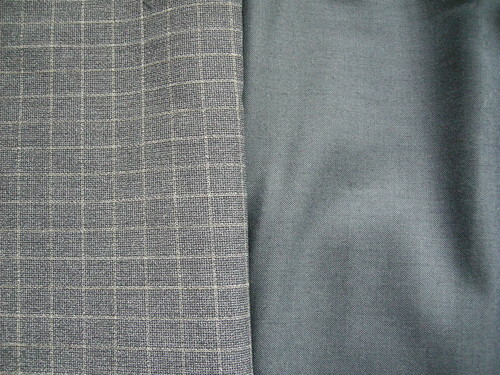 The sleeves involved a little trick - the lower edge of the pattern piece is not perfectly straight but the selvedge is. I started by laying the piece on the fabric (cross-grain) so that the bottom of the curve included the entire border. I then cut the piece except at the lower edge where I wanted to preserve the border and selvedge. To create approximately the right curve, I took a long, narrow dart parallel to the selvedge, between the lower edge of the border and the leafy design as you can see in the next (sideways) picture... or can you? The only hint is that the lower edge of the leafy design is being swallowed up a little bit by the red border, near the under-arm seams. 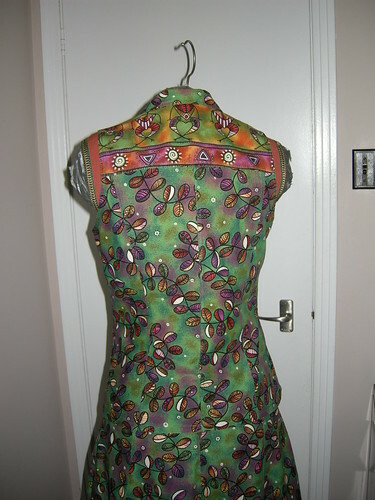 Once I had sewn and gathered the sleeves, this was completely invisible. On the other hand, if I had cut the curved lower edge, the drooping border might have been visibly distracting. These fudging, fast-and-loose techniques might not work for all border prints or all fabrics. Darting the blouse sleeve worked very well with my thin silk fabric - as you can see, the dart pressed perfectly flat (although a slight shaping would have been unnoticeable). Also, both my prints were quite "freehand" - the lack of precise geometrics in both prints meant that the slightly approximate matching and shaping wasn't fighting with the aesthetic of the print. It's still July but I'm thinking about wool - specifically, a scrumptious piece of feather-light wool/cashmere blend of which I have just enough for a sheath dress, and a coordinating, amazing, hard but light and airy pure wool for a jacket (I probably have enough to eke out a skirt as well). The colour is blue - a greyish but still blue blue. I purchased the cashmere blend in Toronto at the Wool House on Queen Street West (highly recommended, if you're in Toronto) and the coordinating fabric in Montreal at PR Weekend at Couture Elle (highly recommended, if you're in Montreal). I gave my little swatch of the Toronto wool to the guy in Montreal and asked him to recommend a coordinating fabric (finding coordinating jacket fabric for 2 dress lengths was another of my shopping goals for the weekend). He strode decisively to a high stack of bolts, pulled one out, placed the swatch on top and ... TA DA! Perfect, first time. This guy is amazing. Is it true that real blazers are in style for fall? I'm not very good at sussing out trends, but what I want to make is a traditional, single-breasted, long and lean jacket with tailored shoulders, and a slightly peaked lapel. I found this in the new Burda envelope patterns. What do you think? It's #7421. (Sorry for the fact that this is not an English page. Thankfully, Burda's unbelievably inept decision to migrate ALL of its English content to the inane "Burdastyle" page, from which it is impossible to find any of the actual corporate content - i.e. its magazine and envelope patterns - has not yet affected its French site). But no - the dress and boots would not be part of my wardrobe plan, though they are utterly cute on this 20-something model. You'll just have to imagine the jacket on top of something more sleek and age-appropriate. Much like this, in fact. (It's a PatternMaster Boutique pattern reviewed here.) Shorter?? OK, I’m clearly running out of catchy names for this spate of exercise-related sewing I’m doing recently. Here’s evidence of two more jacket-and-iron-avoidance projects. I have finished my Champion technical T-shirt knockoff and made a pair of snazzy new bikeshorts. There’s not much to say about the bike shorts. 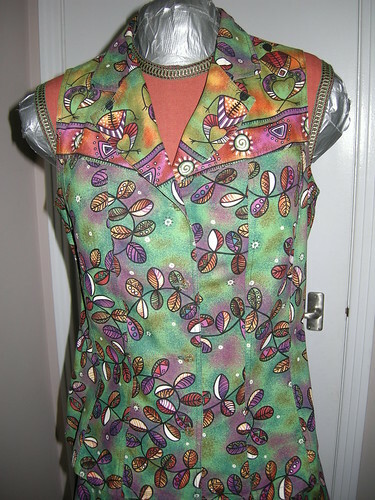 I used an ancient (ca 1989) Stretch & Sew pattern which, by some miracle, is still on their website here. This is the 3rd pair I’ve made. If (as I do) you choose not to make the contrast side stripe, you can construct them from a whopping 2 pattern pieces. Not front and back, but front/back (no side seams if you so choose) and a crotch gusset, which runs from left shorts hem to right shorts hem. 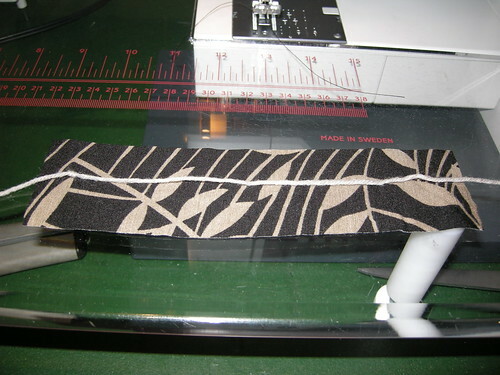 I add another piece – a casing for the waistband elastic. S&S says just to fold the top edge over too-thin elastic. I’m either very long through the crotch as compared with S&S’s ideal figure (which is possible) or these bike shorts are meant to be a lot lower-slung than I prefer. This is also possible, though doubtful, given the date on this athletic wear classic. One of my few fabric-purchasing goals for PR Weekend Montreal, since I knew we’d be visiting the favourite stretch-fabric buying haunts of Jeanne Binet (Jalie), was to buy a good beefy black something-or-other with lycra for new bike shorts. My other pairs are very old and tired. I found this absolutely fantastic bottom-weight which I think is RPL. It’s very firm in its negative ease – easily the most comfy girdle-like garment I’ve ever worn! The S&S pattern also has pieces to make your very own “seat padding” which I have done in the past. However for this pair I installed a commercial pad (all curvy in 2 directions, laminated foamy stuff etc.). I swear my bike goes faster when I’m wearing these shorts, so mission accomplished. I’m going to make another pair while I am in the mood and will have to make the padding myself, so stay tuned for a post on that. 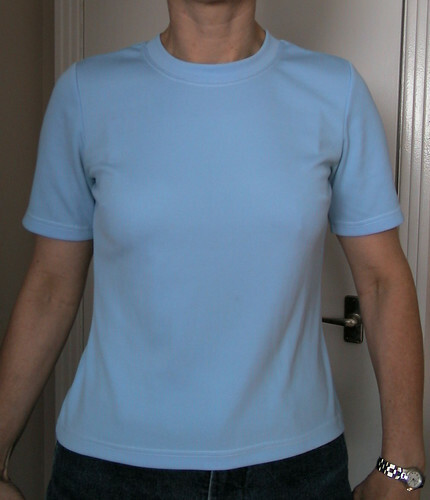 The shirt is one of 2 I’ve completed (a third is cut out) which combines a very stretchy mesh for the dark grey side panels and under sleeve, with a polyester athletic knit purchased some time ago from Wazoodle. To the right is the completed PMB pattern which turned out just as I wanted. That is, it fits exactly like the original plain T-shirt before I started slicing and dicing it, and its style lines are more or less mimicking the commercial shirt I was trying to clone. 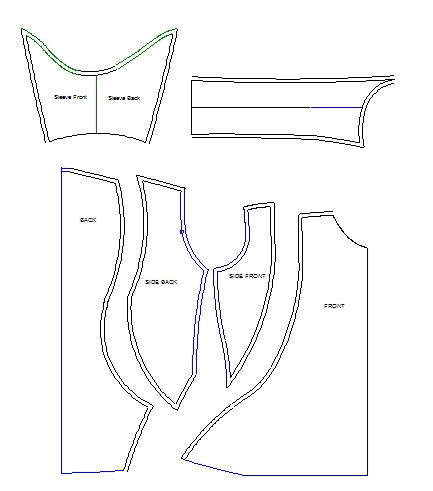 For once I got smart and drafted .65cm (1/4") seam allowances like Jalie does - this uses less fabric and I can sew with my serger by letting the blades just skim the cut edges. The tiny seam allowances make it easy to sew the curved edges without puckering. I used the Jalie neckline technique and it works marvellously even with the rather non-stretchy poly knit. 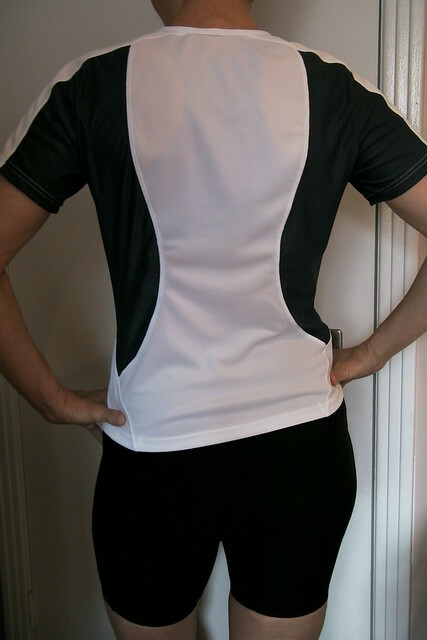 The stretchy panels stretch when I’m hunched over on my bike, so that the whole shirt doesn’t ride up. To jazz it up and get rid of the puckering at the seams, I used a quasi-utility quasi-decorative stitch on my sewing machine. It is hot here! Being inside, in non-air-conditioned discomfort WITH a hot steam iron going next to me, wasn't my idea of fun, which meant that very little sewing got done last week. When the temperatures dipped, slightly, I got started on my knit jacket. But the dratted thing is complicated! I'm sure it'll go faster once the fronts are completely done. In the meantime, I made two more sports bras. They are ridiculously easy, take virtually no fabric at all, and don't require the iron. Plus they are more comfortable than most things to wear these hot nights. And the thought of working out in anything with more coverage is just not too interesting. If this heat keeps up I may make a few more. Tonight I took an break to monkey with a pattern I made for a T-shirt, using PatternMaster Boutique. This is a software program that drafts patterns. 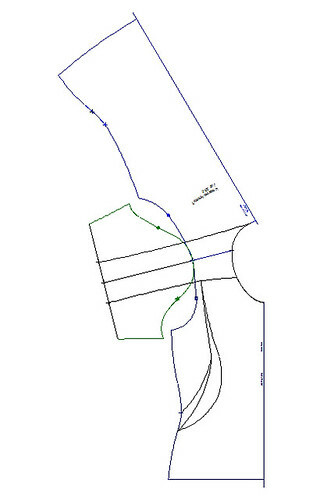 However, for me the real value is that it has a CAD (computer-aided design) component called Pattern Editor (PE for short). Once you have chosen the various pattern elements you like in the pattern-drafting part of the program, you can tweak it using PE. So fun! (edited to answer Gail's question below) My goal with PMB is to develop patterns for true basics that fit well. 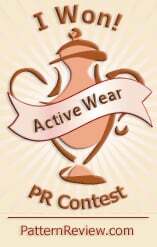 I used it to draft (with PE to refine) a basic T-shirt pattern that fits quite well. To the left you can see the very plain-jane shirt I made myself from this pattern a while back. It's OK but not very flashy, and also it's a bit too tailored (in a not-really-stretchy athletic fabric). I ride my bike in it and I want more room/more stretch across the back. And more ventilation. I went prowling on the www looking for more flash athletic wear and came up with the very technically-named Champion double-dry vented burnout shirt, shown here. The main panels are probably similar to the fabric I used for my blue shirt (100% poly) and the side panels are a mesh fabric. I have more of the poly which I purchased from Wazoodle several years ago and some stretchy mesh acquired in Montreal at PR Weekend. So far my computer pattern looks like this. Those multiple lines on the front will go - I took several tries to mimic the curve of the side panel. Once I like the lines, I'll separate the bits, add seam allowances, print it, and sew it up. Recently I bought some ponte de roma knit (a stable double knit) from Fabricland, to coordinate with my Simplicity 2369 mock wrap dress. It's a teal-ish turquoise in colour, and I believe the fabric is RPL (rayon/polyester/lycra). I thought to make the jacket from Simplicity 3631 again but then had a brainwave or perhaps a sort of heat-stroke (I'll tell you later which, once it starts turning out well or badly) and changed my mind. The style is very interesting but the finishing details are quirky and not really me, I thought. The details are hard impossible to see on the pattern envelope photo, but the pockets and hem edges are bound from the wrong side and the binding (raw edge finished with small zig-zag) encases a bias strip (raw edges) of contrasting lighter fabric. I happen to have a thin burnout knit fabric in a slightly darker tone than my ponte de roma which will curl interestingly when inserted in this way and do fine as the lighter belt/tie. I'm omitting the lining but will do Hong Kong finish with the same thin knit fabric. This fabric combination is completely different than imagined by Vogue - mine will be a sort of sweatshirt version of their very elegant all-silk affair. Here's hoping it will work - fingers crossed. I picked up this vintage (late 1970s) Diane von Furstenberg pattern from Lanetz Living last year, and I had a suitable length (2 metres) of printed rayon/lycra jersey in stash. I bought it from Fabricland in 2008 or 2009. Canada Day 2010, a holiday, the planets aligned, and I made this dress. I wore it to work today, and I may want to keep it on for a good long time, it's so comfy and (I think) good looking. There's not really much to say about it. The extravagance of the collar is evident in the pattern envelope photo, and it does live up to that. It's a one-piece "shirt-style" collar and I found that with the weight of the rayon jersey, a light and somewhat supple fusible interfacing gave it just the oomph required to stand up, or spread open (as I wish). To the left, the collar is UP. To the right, it's more OPEN. Either way, is OK with me. DvF wanted me to cut facings for the armscye but I ignored her and did the same kind of narrow binding that I did on my little tank-top earlier in the week. The only difference is that I started by sewing the binding strip to the right side of the fabric, so that when it was folded over the seam allowance, it would be on the inside. I really like this technique! A detail that gets lost in the pattern photo is the 3 buttons with loop closures. These are working buttonholes, but unnecessary since the dress can easily be pulled over my head. My friend Gail gave me the secret to sewing a narrow filled tube, for just this kind of application. Here is a tutorial. 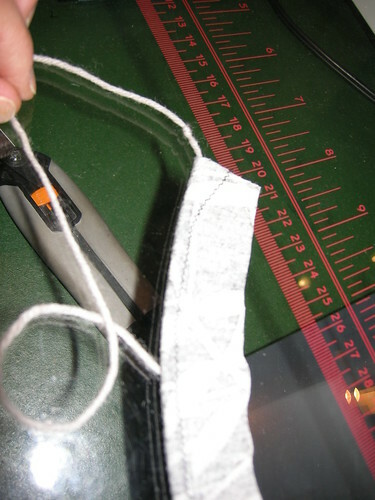 First, cut a strip (lengthwise grain of the jersey to control stretch) of suitable length. My pattern had a piece for this but just calculate - # of loops required by (length of loop needed plus 2 seam allowances, one at each end of loop). Cut a length of yarn that is about 2x the length of your fabric strip. 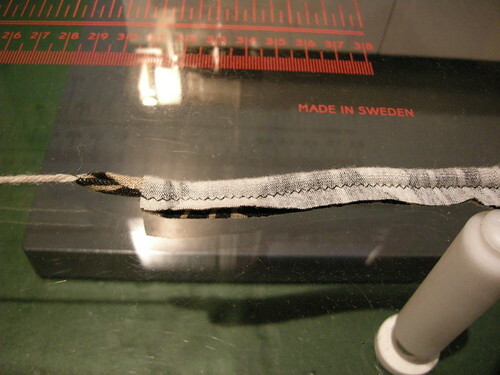 Place it so that half of it is on the fabric strip, as shown (half its length is to the left of the strip). Fold the strip of fabric lengthwise, RS together, over the yarn. 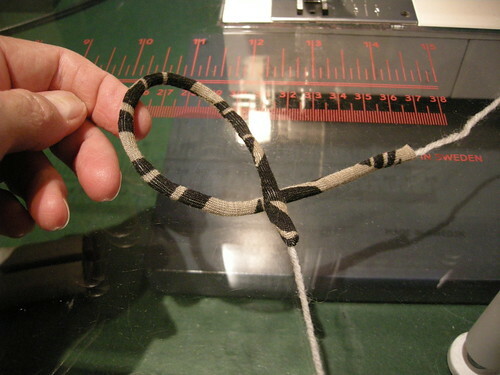 Set your machine to sew a narrow zig-zag (I used 1.5 x 1.5 mm). 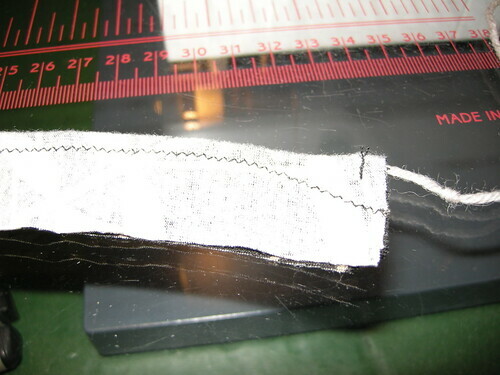 Start wide at one end, then angle your stitching to the desired width of the tube (here, about 5mm). You are encasing one end of the yarn inside the sewn tube. Be careful not to catch it with your stitching! Then sew across the yarn at the wide end, making sure the yarn is good and caught at that point. The yarn (to the right in this photo) is at least as long as the fabric strip. 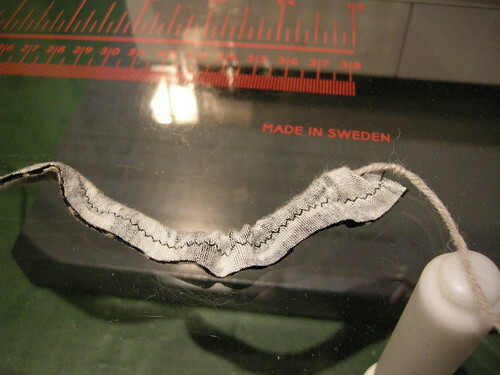 Then trim the strip fairly close to the stitching - I trimmed at about 5mm. The next step requires you to grasp the yarn tail (to the left in this photo) and the point where the yarn is caught (to the right in this photo). Pull gently on the yarn until the caught end of it eases into the wide end of the tube, as shown here. Keep pulling gently, easing the other end into the tube and preventing it from bunching. Eventually the yarn will pull the tube right side out, as shown to the left. Admire the finished tube. Then cut it as needed and sew it in place. For my dress, I made 3 button loops big enough to accommodate a 1/2" domed button.